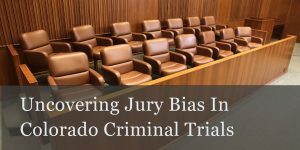 Uncovering Jury Bias In Colorado Criminal Trials – The Challenge For Cause – One of the most critical times of any Colorado criminal trials is the selection of the jury – the fact finders who will ultimately decide a Defendant’s fate. Yet this important aspect of criminal trial is given little attention – and most importantly little time by the Courts. Jurors are excused on two primary basis – the peremptory challenge which is used when a challenge for cause is denied and which challenge is limited to 3 challenges for a 6 person jury and 6 challenges for a 12 person jury and ..the challenge for cause – where a juror is essentially excused because they are biased. Only 0.5% of all cases filed in Colorado district courts ever go to trial. In 2014 there were only 1,264 jury trials in Colorado out of more than 230,000 cases filed. While there are actually very few jury trials – it is critically important that these trials – that so impact the lives of our citizens -are fair and just. Unfortunately, the jury selection process has been truncated in Colorado because of the crush of other cases thus limiting the time Trial Judge’s are willing to permit for the jury selection process. The Sixth and Seventh Amendments to the U.S. Constitution and Colo. Const. Art. II, Section 16; U.S. Const. Amend. VI. – are the source of the mandate for Colorado trial courts to exclude jurors who are biased or prejudiced against either party in a Colorado criminal trial. Many times a juror will admit they are biased under direct questioning. Later, when pressed by the Judge – or a party to the case who FAVORS that bias – they are “rehabilitated” and allowed to serve on the jury. A juror – to insure a fair and just trial – must be impartial and capable and willing to decide the case solely on the evidence heard at trial. “Voir dire” the name given to jury selection – means “to speak the truth.” The purpose of voir dire is siad to select as fair and impartial a jury as possible. The truth is this – both sides to a Colorado criminal trial – are attempting to remove the MOST BIASED jurors as against their position. The “cause challenge” is integral to this goal. The truth is this – the time given to lawyers in the selection of a jury is so limited in todays’ courtrooms – it is nearly impossible to accomplish that mission. Eliciting the biases and prejudices of potential jurors, fully aware that most jurors are “less than candid ” when asked direct questions about their beliefs and attitudes, makes the task Herculean. To properly use the challenge for “cause” in a Colorado criminal trial – there is a need for MORE TIME for jury selection. Colorado Trial Courts force a very rapid and often chaotic form of jury selection … Judges, in a rush to complete trials in unrealistic time frames often give each side only 20-30 minutes for voir dire. Jurors end up answering leading and intimidating questions to “get on” with the trial and to “rehabilitate” jurors who state they have certain “biases” when first asked the opening salvo of questions. The practice of using leading questions to compel a juror to agree they won’t act on their bias erodes trust that unbiased jurors will ultimately comprise the final jury. There is a balancing here – sacrificing DUE PROCESS for a justice system that rewards efficiency and expediency over and above a Constitutional requirement of an impartial jury is a mistake. This approach – efficiency over due process – violates not only the Constitution but the fundamental principles of our country. Many judges limit voir dire to 20 or 30 minutes for each side – that amounts to less than a minute or two for each juror on the initial panel. Speeding up the process to this degree in a Colorado felony case can only result in an unexamined panel prone to making decisions based upon undisclosed biases. Where a Defendant’s liberty interests is at stake, especially in a felony case, limiting jury selection to 30 minutes – emphasizing speed over justice violates the guarantee of the right to an impartial jury. Inadequate voir dire to means unqualified jurors. Judges have the inherent authority to increase or shorten attorney voir dire . Colorado Jurors who swear to tell the truth and then reveal their bias under direct questioning should be stricken for cause. This result should not change when a judge or attorney asks the entire panel if they can follow the law or be impartial and no one speaks up. If there is sufficient reason to question whether the juror could act as an impartial fact finder, the trial court should grant a challenge for cause and dismiss jurors empaneled, under the watch of the trial judge, are without biases or prejudices that can foil a fair juror. Do you believe you could be fair and impartial and set aside your personal views? Actual studies have established that the answer YES – to this question does NOT MAGICALLY remove the bais – does not cure bias and should never be used to avoid striking a juror for cause. The Courts of Colorado should not rely on this kind of unreliable self-diagnoses ending in the seating on the jury of biased jurors which could easily lead to many wrongful convictions. It is far better for the Trial Judge to err on the side of caution and grant a motion for a challenge based on cause than to risk a biased jury. You should be careful to make a responsible choice in selecting a Colorado Criminal Defense Lawyer – and we encourage you to “vet” our firm. Over the last 30 plus years – by focusing ONLY on Colorado criminal law – H. Michael has had the necessary time to commit to the task of constantly updating himself on nearly every area of criminal law, to include Colorado criminal law and procedure and trial and courtroom practice. H. Michael works hard to get his clients the best possible results in and out of the courtroom. He has written, and continues to write, extensively on Colorado criminal law and he hopes this article helps you in some small way – Uncovering Jury Bias In Colorado Criminal Trials -The Challenge For Cause.